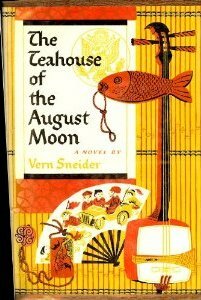 The Teahouse of the August Moon, by the American novelist Vern Sneider, is a gentle comedy about the American occupation of Japan after the Second World War, where the Japanese get the better of the Americans, the Americans organise the Japanese more efficiently, and everyone learns to love each other’s way of life. My fascination with this book began because it was a beautiful fairy story with a happy ending. Later, I reread it to enjoy the tidy way that everything worked out just fine: I do like the practical organisation of happy endings. I also reread it endlessly to get to the bottom of the mysterious geisha girls: why were they such a problem? They seemed so nice, and did their own sewing. According to his obituary in the New York Times, during the Second World War Vern Sneider had been part of the American military government team that installed itself in Okinawa in April 1945, as an occupation force. He became the military commander of Tobaru, a small Japanese town of 5000 people. This book is based on his experiences, and must be one of the most gentle novels about army occupation ever written. It must also have been a whitewash, a sanitised recounting of a traumatic time at the end of war. In April 1945 Japan had not formally surrendered to the Allies, so the Okinawa occupation was definitely an invasion by the Americans. In August 1945 the first atomic bomb was dropped on Hiroshima. Okinawa is only about 600 miles south of Hiroshima and Nagasaki, halfway to Taiwan in the middle of the East China Sea, but the bombs are not mentioned at all in this delightful, wise and charming novel. I’m puzzled about the absence of war in the novel. The horrors that the world inflicted on Japan (as well as those that Japan were responsible for) are completely absent in the novel. It’s as if the war is a long way away. Everyone just gets along fine. Okinawa, and the village of Tobiki, is a dead-end posting for amateur soldiers, somewhere to keep them from doing any damage. There is no place in this novel for trauma or wartime bitterness. The Teahouse of the August Moon was very charming in its day. It was adapted into a Broadway play, in which form it won a Pulitzer Prize, and then it was Hollywoodized into a Marlon Brando film in 1956. Vern Sneider wrote five other novels, but nothing else seems to have been recorded about him, except that he died aged 61 in the early 1980s. The Tea-House shows that he had a gift for narrative and for telling a story with economy. He knew how to encourage his reader to feel affectionate about his characters. He was writing for readers who knew American army slang, and who would enjoy a story about the Occupation. The Americans are uncomfortable in the roles of overlords and aggressors that the army wants them to fit, and are very happy to slide back into more familiar identities of company boss, head farmer, patron of the village, and advisers in the ways of civilisation. This is a book about the great civilising and dampening force that is small-town America. At the same time, Sneider was very careful to make sure his readers emerged from the novel ready to book their tickets to Japan, to see for themselves what tatami mats looked like, and what a dahisen sounded like when heard in the evening through the pine trees. He wrote for a Readers’ Digest audience as well as for a discriminating audience who weren’t afraid to be teased about being uncouth or uncivilised. The Teahouse of the August Moon is about a shabby farming village in the middle of nowhere that rapidly changes its ways when two geisha girls come to town. They are given to Captain Jeff Fisby, officer in charge of Tobiki village, by their owner, who rapidly gets out of town before he’s arrested for procuration. The geishas are amazed when Fisby refuses to have anything to do with their business, because he thinks they’re prostitutes. This is the first lesson in Japanese culture for the American readers: there is a difference between high-class, sophisticated geisha, and the common girls of the streets. These geisha girls are ladies, they are highly trained in the civilised arts, they can sing and dance and keep a party going with sparkling conversation. They are professional entertainers, and become very influential in Tobiki when the townsfolk realise how much they want to live a culturally enriched life. The geisha have no competition: the other women in the town are peasants who wash their feet in drainage ditches and keep pigs in their huts. By letting the geisha do what they want to install culture and civilisation in the town, Fisby involuntarily releases the forces of city sophistication into rural Japan, and the results are a delightful lesson in economics and city planning. First the presence of the girls and their charming ways spur the local men into competing for their attention. The normal work routine is disrupted: no-one wants to dig sweet potatoes any more, when they could sit and drink tea with First Flower and Lotus Blossom. When the girls realise they really can stay, they decide to build a tea-house, so they can live there, and practice their profession. Building wood is acquired by demolishing a house, to which the owner agrees because then he has the right to sit beside First Flower at their meals and tea-drinking parties. A landscaped garden is created in a former swamp. Because Fisby is a good-natured man who wants a quiet life, he is quickly drawn into the supply chain: he needs to find the villagers building materials, and sea salt, the materials for tatami mats, and the special paper for wall panels. He also needs to find the people who can make these traditional things, and so discovers a life of traditional crafts all over the island that he didn’t know existed. He finds a way to use these Japanese crafts to barter with the American PX for the food they don’t need, and discovers that the old men in the village make the best lacquer ware in the island. He learns about the economics of the developing tea-house business rather slowly. He really is a bit of a chump, but he is also a businessman, he ran a pharmacy back home, so he applies small-town business practice to the developing teahouse business, and the teahouse blossoms. He encourages tea ceremony training for the local women, who are jealous of the geisha girls getting all the men’s attention. They want to be ladies too. All this socio-cultural engineering is really very odd for a serving officer of the American army. Fisby doesn’t realise that his activities are attracting suspicion from higher up. Fisby’s commanding officer, Colonel Purdy, has fierce energy and stupid ideas. His town planning unit is a caricature of American blindness to local needs: he makes elaborate plans to build a bicycle factory on an island where the tracks are basically made of mud. He spends weeks overseeing the design of a new currency decorated with his own face. He wants the old houses to be torn down and replaced with new, hygienic Williamsburg-style houses in clapboard with white picket fences. He carries out instructions from Mrs Purdy, and from her ladies’ club in Pottawattamie, which are spectacularly colonial, and see no further than their own lifestyles. Colonel Purdy has quite obviously been parked on this island where he can’t do any harm, to keep him out of the way. Because Fisby talks absent-mindedly about rice bartering and geisha ownership, the Colonel thinks that Fisby is suffering from delusions of grandeur, so he sends in a medical officer to make a report. But Doc McLean is much more interested in the restaurant at the new tea-house, and before we know it the Doc has given in to his own fantasy of grandeur – of running a little specialist farm for the restaurant trade – and has begun planting Japanese cabbages for pickling. So now we have both Fisby and McLean working flat out to keep this new local economy going, supporting the geisha girls’ cultural and community work, and the village is a very happy place indeed. But then Colonel Purdy comes to make a visit, and that’s when we see exactly how much the village has changed from its mud-based pre-American life. Japanese civilisation comes off best in this book. Fisby has no particular dreams, he just wants a quiet life. But Doc McLean longs to be a farmer and a homesteader, and finds his dream on a Japanese hillside farm. Colonel Purdy wants to be pirate, or an explorer, he wants to sail the China Seas and do a little smuggling, and Fisby finds a way to solve all his problems: get the Colonel out of his hair by sending him on a trading mission to China to buy rice, which the tea-house badly needs for saki and sushi, and let him do some private smuggling en route. They find the dreams of adventure they long for in the civilisation that is slowly conquering them. The Teahouse of the August Moon is a fantasy, it’s charming, it’s delightful, it’s not going to frighten any horses, and you can safely give this to your conservative grandmother or your 10 year old daughter: I can’t think of a more family-friendly book. But it’s not anodyne: it has a bit of a bite because it’s sending up the most powerful nation on earth (at the time), and it’s using the insidious power of romance to educate us all in basic economics. Kate Macdonald is teaching British literary history to her Flemish students this term, and podcasts weekly on www.reallylikethisbook.com. No Comments on "The Teahouse of the August Moon"
Kate used to be an editor, is now an English lecturer, and podcasts on the books and authors that time forgot, on www.reallylikethisbook.com.